The Roses Patina Bronze Cremation Urn is cast from bronze into a simple cube and features a gorgeous green patina finish. 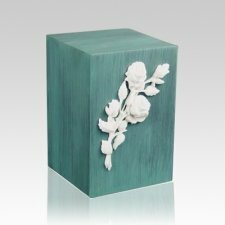 The urn is then accented with a stunning marble appliqué of long-stem roses. This beautiful urn will create a dignified resting place for all eternity. "Really impressed with both the selection and customer service. Memorials.com made it easy to order this urn and shipped it to the Pet Crematory in a week (complete with engraving). It was one of the few things that really went smoothly during this most stressful time."